H.M.S.Hardy’s Ensign on show at H.M.S.Raleigh training base, Torpoint Cornwall. H.M.S.Hardy was completed in 1936. She was 337 feet long, 34 feet in the beam, with a draft of nearly nine feet. She was powered by two shaft geared turbines linked to three boilers, and could reach speeds in excess of thirty knots. For armament she carried five 4.7 inch Mk1X quick firing guns in single mountings, eight 0.5 inch anti aircraft guns in twin mountings, and eight Mark 1X torpedoes in quad mountings. Her complement was supposed to be 175 officers and men, but at the time of the battle she was probably carrying more than that. The Jane R. over the wreck of H.M.S.Hardy. Photo Frank Beng. On the morning of April 8th 1940, the British mounted Operation Wilfred, who’s main purpose was to lay mines of the southern side of Vestfjord, together with a dummy minefield off Bud. Besides the Battleships Renown and Warspite, and the Carrier Courageous, the minelayers were to be escorted by the Second Destroyer Flotilla under the command of Captain (D) Bernard A.W. Warburton-Lee, in H.M.S.Hardy. Whilst the British were mounting ‘Wilfred’, the Germans had started Operation Weserbung, with the intention of occupying Norway. Thus, unknowingly, both Fleets were due to be in the same bit of sea at the same time. In howling gales and snowstorms, elements of both sides spotted each other and briefly engaged, only to loose contact in the atrocious weather. Neither side really knew what was going on, especially the British, but the brief encounter caused a flurry of signals back to the Admiralty. They knew nothing about the events that were about to happen in Narvik, but had already had reports about German warships approaching Oslo, Trodheim, Bergan and Stavanger. The Admiralty immediately issued orders for the task Force to keep watch on Narvik and report any developments. At 1200 hours on April 9th Captain Warbuton -Lee was in the Vestfjord when he received a signal from the Admiralty telling him that some troops had landed at Narvik, and ordered him to seizee or sink their transport ships, and if he thought prudent, recapture the Town. Warburton-Lee, or ‘Wash’, as he was known to his crew, was a bit of a ‘press on’ character, and relished this new challenge. He decided to sail for Narvik with five Destroyers, Hardy, Havelock, Hostile, Hunter and Hotspur. But before he fully committed himself he wanted to find out a bit more about what was going on. So at 1600 hours he stopped at Tranoy and sent two officers ashore to the Pilot Station to ask around. Even though there were some difficulties with the language, it transpired that at least six warships and a U-boat had passed the Station on their way to Narvik. ‘Wash’ passed all this information to the Admiralty and informed them of his intention to attack the next day at high tide. On April 10th 1940, at 4-30 in the morning, Hardy, Hunter, and Havelock steamed into the harbour at Narvik leaving Hostile and Hotspur to guard the back door. Arriving inside the harbour, Warburton-Lee immediately torpedoed the Wilhelm Heidkamp, the flagship of Kommodore Bonte, Senior Officer Narvik Destroyer Force. The stern was blown into the air, killing Bonte and eighty of his men. Next to go was the Anton Schmitt, which was torpedoed and sunk with the loss of sixty three men. In the ensuing battle the Dieter Von Roeder launched eight torpedoes, none of which scored a hit, but she sustained many hits herself, and later caught fire, as did the Hans Luderman. Whilst all this was going on the Hotspur, which had been guarding the harbour entrance, came alone into the harbour and torpedoed two merchant ships. Since no German warships had been seen outside the harbour, Warburton-Lee thought he had all the Germans in the bag, (he didn’t realise that there were another five Destroyers nearby) so he turned his vessels at high speed and came back into the harbour to have another go at the merchant ships, blazing away with his guns, sinking and damaging six vessels. Up to now he had been incredibly lucky with only Hotspur suffering any hits, but as Warburton-Lee gathered his forces to depart his luck started to change for the worse. The British Destroyers laid down a thick smoke screen to hide their departure, but as they headed out across the Fjord they ran into the five other German Destroyers as they charged into the Ofotfjord. The Georg Thiele and Bernard Von Armin came from Ballanger, and the Erich Giese, Erick Koellner and the Wolfgan Zenker sailed in from the Herjangfjord, surrounding the British Force in a pincer movement. In a fierce battle the five German Destroyers fought the five British Derstroyers with sustained and rapid gunfire. Most of the German gunfire targeted the British Flagship Hardy, which came under fire from two ships, most notably the George Thiele. The Hardy sustained several direct hits and soon burst into flames. When the bridge took a direct hit, Warburton-Lee was severely injured, but before he collapsed he ordered his Flotilla to ‘keep on engaging the enemy’. Churchill inspecting the’ Hardy’ Survivors at Horseguards Parade, see film below for more. Other than Warburton-Lee, nearly everbody on the bridge had been killed except for Paymaster Lt. Geoffrey Standing, the Captain’s Secertary. He awoke from the fearful blast to find his foot wounded, the ship out of control and heading for the shore at thirty knots. Since the wheel house was below him and nobody was answering his increasingly desperate orders to put the wheel over, he managed to hop down a ladder to the wheel house and alter course, enough to stop hitting the shore. When he regained the bridge helped by some seamen, he saw that they were now heading for two German destroyers. Since he could not slow down he decided to ram one of them. Luckily for all those left alive on board, whilst he was deciding which one to have a go at, one of the boilers was hit and the engines ground to a halt. The wreckage of the Hardy. Note the shell in this left hand photo. The wreckage of the Hardy. Note the shell in the left hand photo. All the front guns on the Hardy were by now inoperable, but one of the stern guns was still banging away at the Germans who naturally returned fire into the burning wreck. Luckily the Hardy still had some ‘way’ on her which allowed Stanning to manoeuvre her into Vidrek where she ran aground. As she glided ashore still blazing furiously Stanning gave the order to abandon ship. One hundred and forty men plunged into the icy water, and in between the shell bursts from the German Destroyers, managed to clamber to safety on the shore. Warburton-Lee was still just alive when they got him ashore but died an hour later. The wreck of the Hardy lay burning until it lifted of the shore at high tide and drifted over to Skjomes where the vessel finally capsized. Warburton-Lee was later awarded the Victoria Cross, the first posthumous V.C. to be awarded in the Second World War. One of the many casualities. Probably the most famous of the British Destroyers in the battles of Narvik, Hardy is now just a huge debris field right close into shore. It is not really a dive, more a rummage, and you could do with a lot more time than the half hour allotted to us. Still, found a porthole, a gas mask, and many small cartidge cases.The wreck’s history gives the place a certain aura, and I for one, was glad to visit her last resting place. On the 75th Anniversary of the Battle of Narvik, author Ron Cope shines a spotlight onto the brave young sailors behind this dramatic military campaign, including his father. 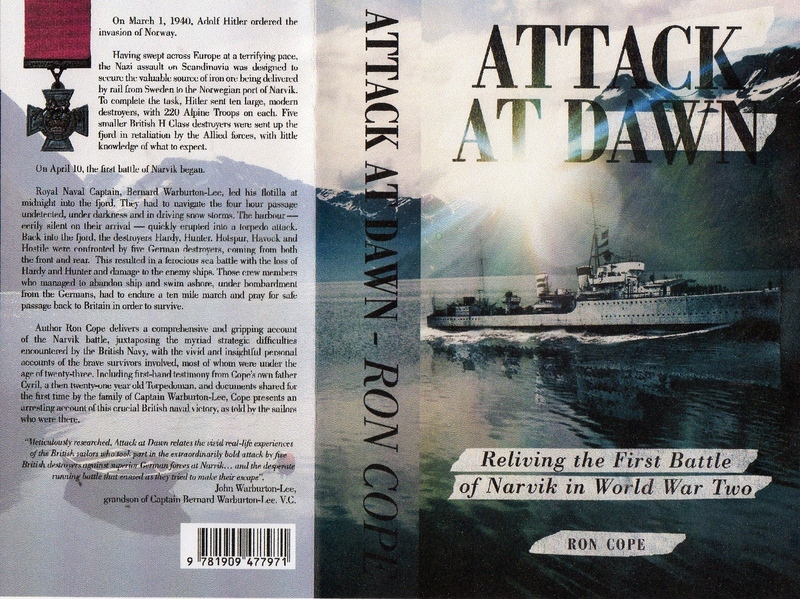 Attack at Dawn: Reliving the First Battle of Narvik in World War Two by Ron Cope (published by Clink Street Publishing RRP £11.99 paperback, RRP £7.99 ebook) is available from 10 April 2015 online from retailers including amazon.co.uk and to order from all good bookstores.RRP £11.99… ISBN:978-1-909477-97-1 Ebook : 978-1-909477-98-8. My father Cyril Cope who passed away in 2005 was a Leading Torpedo Man. He began the Narvik Association which went on for many years before disbanding because of his ageing years. He organised many reunions subsequent to members joining from other warships in the flottila or involved in the two battles in April 1940. There was also connections with German sailors who attended reunions. My father made two trips back to Narvik for ceremonies including the 50th Anniversary. I was privelged to accompany him on that occassion meeting members of the community including those who helped him and other survivors when they made it ashore. I followed my father’s footsteps and enlisted in the RN in 1964, retiring in 1986 as a Chief Petty Officer. Because of his apparent photograthic memory he was able to describe the events to a number of authors and media presenters. I have audio tapes of one of his interviews from which I hope to put to type and write a book about his exploits. my grandfather was a stoker on hardy he went overboard when the ship went aground he told us that the germans were shooting at them in the water he had his friend i think his name was geordie howie i dont know if i have the name right. My father, Harry Rogers ( 92 today, as I write ) survived the sinking of the Hardy but only just. He received shrapnell in his lung and was cared for and nursed back to health by a Norwegian family for whom he is forever grateful. He still has the shrapnell in his lung as it was too dangerous to operate and I suppose it is a permanent reminder of that epic day for which he still has vivid memories. I think my Dad is either extremely lucky or unlucky as he also survived the sinking of the HMS Prince of Wales in the South China seas. As you can imagine he has enough genuine stories to write book, but I guess he just wasn’t the literary type. His escapades have however provided a few newspaper clippings over the years. My father, Harry Rogers, is a fortunate survivor of HMS Hardy as he was wounded with shrapnel in his lung but was looked after by a Norwegian family who undoubtedly saved his life. Harry is 92 years of age now but can still recount his memories which also include him surviving the sinking of the HMS Prince of Wales. I am not a Naval man myself, but if you would like to get in touch then maybe through my father I can assist with your research. Thank you for your responses. I have had E Mail from Tony above. and have replied to him. This will be a long ongoing task in the initial stages of research. Paul your grandfather’s account is very similar to my father’s. keep in touch. roncope@btinternet.com. hi there.ive been looking at you tube on the battle of narvic and ive come across your comments here,,,my dad was on the hardy sadly he died a long time ago but ive always remembered him talking about his time on the hms hardy..i do have some old pics and things…tony ask you dad does he remember robert mcatamney (bobby),he was from carrickfergus co.antrim n.i. its very sentimental all this to me..please let me know..thank you.kate.. Thank you Peter Mitchell for this web site ..do you have the exact latitude and longitude for the remains of Hardy ? Ron Cope. Thank you Pete for your swift reply and any information would be very interesting and helpful. My apolagies to Tony in two of my above comments..where I called him Roger. Paul Davies did you know Daryl Harries ..son in law of Lillian (nee Mantle ..as in picture of Hugh Mantle’s grave) has been in contact with me. I have an interest in HMS Hardy as my uncle who was Acting Leading Gunner Alex Hunt who was unfortunately killed in the first battle of Narvik. Having read into the battle, many years ago, my family were told, from a person that was on the ship with my uncle, that it was my uncle that stayed at his post firing the stern gun. If there is anybody that has any information on my uncle, I would appreciate it. Paymaster Commander Geoffrey Stanning was my father. He was never sure that he had done the right thing in beaching HMS Hardy, but I am convinced that his actions saved many lives. Rosemary, I was very pleased to see you responding to this brilliant website which has brought together a number of families of those killed or who were fortunate to survive. Referring to my own past comments I have now completed typing my father’s transcripts he left to me in 2003. Obviously he mentions your father and in our past discussions he had much admiration for your father’s leadership prior and after abandoning ship. I would be most grateful if you contacted me on roncope@btinternet.com. On another note..I have had a query from the family of Hugh Mantle (who at eighteen was the youngest sailor killed on Hardy) as to whether there is going to be a memorial service on 10th April 2010. To my knowledge there is nothing planned. However 2010 is the annual anniversary so a service could be arranged at some stage this year at Hardy’s home port of Devonport. Please contact me by E Mail if there is anyone interested in such an event. Ron Cope. John… an amazing story that adds to the events of that historical day of 10th April 1940. We look forward to you joining the family links I have so far had the pleasure to be in contact with. I have made a considerable effort in the last month to make aware of the 70th Anniversary of the Battle in Narvik to a number of regional and national newspapers. The response as been better than I originally thought possible. Initially I focussed on regional newspapers in the areas of my original family links. This has expanded to national newspapers. Hopefully this will result in an increasing number of those associated with the Narvik making contact. Watch out for April 2010 ‘Navy News’ where there will be a special supplement featuring the ‘Battle of Narvik’. I am still looking for those who would be interested in a special ‘Memorial Service’ this year at HMS Drake Barracks. I can also inform you that Harry Rogers (the so far only remaining survivor of Hardy I have found) is doing well and hopefully shortly will be featured in the Middlesborough Gazette. Finally great thanks goes to Peter Micthell on this ‘website’ who has been awesome. Ron Cope. Having just read a story in the Western Morning News I was facinated as I knew my father was on board HMS Hardy and survived but was killed in a RTA in 1956. The only reference the family had was a news paper report which i have copied (part) below, I hope it may be of interest to others. Bernard Mostyn Kennedy (Born Cwmbran Sth Wales)…. eventually to become a signaller in the Hardy. When that ship was sinking at narvik, Mostyn saw that his pal Gunner Geoffrey Bailey hah had half his hand blown blown away. He pushed Geoffrey through 200 yards of icy, bullet-riddled water to shore. After receiving help from Norwegian villagers, they made snowshoes out of lifebelts and struggled to an American hospital 16 miles away. Later, when a British destroyer was spotted, Mostyn signalled a message with a small torch. In a borrowed boat, they pulled out to the ship (which turned out to be the Ivanhoe) and were taken aboard. My thanks to Ron Cope for the information it has helped to fill a few gaps, best wishes Lance G J Kennedy CC. My name is Edith, so named after my mother. Being the elder of Cyril Cope’s 4 children, my father one of the survivors of the Hardy. Ron the above being my youngest brother. I was born in 1942 during the aftermath of the sinking of HMS Hardy. I live in Plymouth and have seen for myself the ensign brought back from HMS Hardy. In the Western Morning News (issue 6th April) local to Plymouth there is a great tribute to HMS Hardy. Like the comment left above by Rosemary Barnes, I too think the choice to ground her was the right one. The great navy tradition of my family is being carried on by my 2 sons and my grandaughter. As a little tot, I was once a welcomed visitor down the mess deck of HMS Hardy then HMS Rodney, when they were in port here in Plymouth. My name is Nichola, proud grandaughter of Cyril Cope. I miss my grandads stories but most of all i miss him. All the above heros will live on in our children and will never be forgotten. I found the previous comments very interesting with the exception of a small error made by the diver in the film. Years ago in the mid- sixties my brother-in law,who lives near Ballangen,told me that the “Hardy”,lying on her starboard side, was being cut up by an Italian salvage team and being transported away in barges,thus the large debris field the divers had explored had been created by the salvage team and was not the result of her heroic battle. Further to my previous comment. In 1972, as guests of Mr Cyril Cope,my wife and I attended the London reunion of the survivors of the first battle of Narvik. There I met the widow of Capt.Warburton-Lee V.C. [Mrs Elizabeth Sutherland] who told me that a shooting trophy belonging to her late husband had fallen through from his cabin and been lying for years in the bottom of the ship. The Italian Salvage Team found the trophy,cleaned it up and returned it to her. There is another survivor of the 1st Battle of Narvik… he had his 90th birthday a couple of months back. I have a copy of the story he wrote as he returned to the UK on the MV Franconia along with the evacuated troops from Norway. When the shell hit the bridge and the coxswain killed he took the wheel. Lt Stannard ordered him to steer to ram the Germain destroyer but it was realised she was sinking and he ordered him to run her ashore(yes Rosemary they saved a lot of lives). Les Smale who was then a A/B was in 1960/1 my buffer on HMS Cavalier. He was awarded a BEM and a finer Englishman you will not find. He still lives in Devon. I am currently producing a booklet (by hand on my computer) about it and some other survivors stories. Can I use the picture of the Hardy on her side please? I have 2 photos of HMS Hardy taken in June 1945 after she had been stripped by the Nazis of anything of value. Are these of interest…? I have now located two survivors of Hardy still alive so Les Smales will be the third. I seem to remember my father mentioning his name. So far I have made contact with 14 families of those whom were either mortally wounded or fortunate to survive. I would be very interested to hear from Les or his immediate family. With regards to using the photograph of Hardy as shown beached get in contact with me as I have queried this with some one who has used it as well as other material. Yes I would be interested to see the two photographs. Especially to go along with other information I have gathered regarding ‘what happened to Hardy and some of its contents. Message for Rosemary Barnes. I am still collating information from families associated with HMS Hardy which now stands at 16. However, so far I not been able to make contact with families of those officers on board at the time of Narvik. I would not like my book to be just about ‘the lowerdeck’ sailors experiences. I am trying to make contact with Captain Warburton – Lee’s family. Whilst I know he was a Welshman in fact he lived north of Shrewsbury, Shropshire and there are grandchildren in the Wrexham area. Barry Knell I am pleased to learn that Les Smale is alive and well at the age of 90. I first met Les 20 years ago when,as two ex-shotley boys, we joined the “Ganges Association” local group in Exeter. We subsequently lost touch when the group folded in 1999. I have an excellent article about him entitled “An Able Seaman” written by the late Capt. John Wells R.N. and published in “The Naval Review” of Nov. 1995, it describes his exploits aboard the “Hardy”, however I doubt if it could be used [ in full or part] again due to copyright law. My Grandfather was the Chief Stoker Edward T Stiles (Stormy) on HMS Hardy during that fateful day he unfortunately died from his wounds on the morning of the 10th May 1940. Having been taken ashore and then carried to the Madame Christiansen’s house. I had the pleasure of meeting both your father and mother in 2000 a long story. As i recall when i visited your father he had quite a lot of newspaper cuttings and memorabilia about the battle and photos of HMS Hardy beached, Your father also told me that HMS Hardy was broken up for salvage. There is a photo of Hardy in Grand harbour held in Plymouth’s Naval history department unfortunatly it is not dated. Narvik and After by Lord Stabolgi and Narvik battles in the Fjords by Capt Peter Dickens. I believe that your father had some input to this book. Thanks Mike As you are aware I have already sent you an E Mail… being thankful that finally not only have I made contact with you but also possibly the Stiles family in Canada. As you know Cyril and my mam Edie met you all at reunions and their home in Exeter. Cyril and Edie spending a holiday in Canada as the Stiles family’s guests and a wonderful time they had. I have both those books you mentioned and because after the war we moved on and into 1970’s Peter Dicken’s book (a great grandson of Charles Dickens) is probably the nearest to a true account. I say this due to the Lord Stabolgi book being printed at the end of 1940. So in my view for obvious reasons he was not given from his contacts in the Admiralty sufficient information. However, if there is anyone who would like me to send an attachment copy of relevant pages of both Battles of Narvik from Peter Dickens book. Although some ‘Narvik’ friends I have contact with decided to purchase the book for posterity reasons. Another authoritative account of the Norwegian Campaign is ‘ The Doomed Expedition’ by T.Adams. I was fortunate to meet Jack (has he liked to be called) in1990 .the 50th Anniversary in Narvik. He was a very interesting character from South Wales I believe. I am still looking into geting a copy. It seems going onto the ‘Amazon’ website you can still purchase the books mentioned. Ron Cope (‘roncope@btinternet.com’). Message to Barry Knell. To say thanks.. I have made contact with Les Smale. You’re never too old to go onto the internet as Les is proving. He is in good health and I am looking forward to increasing my research material. Thanks also goes to Bill Sanders whom through my father I have known for years..and also like Les a finer man you will never find. My daughter, Nicola Mulryan, is the manager of the Narvik/Ofoten Tourist department and has edited the english version of the Destination Narvik Tourist Informatin Guide. In the current issue of the guide is a photograph of the graves of some of Hardy’s crew. Some of your correspondents may be interested in this. re your picture of survivors with Winston Churchill the short man in the light jacket and bobble hat is my wifes Grandfather his surname was Aquilina.. don’t hesitate to e mail for anymore info. Dear Mary and Tony Leavey thanks for your comments which Mary has also made on another dedicated section about her grandfather Carmelo Aquilina being a crew member on HMS Hardy. However, there is no mention of your E Mail address to enable me to contact you. I await you contacting me direct at ‘roncope@btinternet.com’. I have been trying to make contact with the person described on Horse Guards Parade standing on the right hand side of my father Cyril Cope. I look forward to hearing from you in the near future. Ron Cope. Carmelo Aquilina was my grandfather and he was chief petty officer steward, (ships cook) he broke both his legs when the Captain scuttled the ship and managed to get to shore, he was looked after in a German Hospital and eventually was in a German prisoner of war camp. I have a newspaper cutting of the event when the first sea Lord at the time met the crew. As a boy of the early fifties I still have many fond memories of the stories my Grandad spun me whilst in Malta. Glad to share when we get a chance. My father was a naval historian in Newfoundland, he served in the Royal Navy up until the end of the second world war. Newfoundland joined Canada in 1949. One of the items he left me when he passed was a gift given to him by some one from The Hardy. It consists of two dinner plates, two cups and saucers. I was told they were from the officers mess. They are Crescent, George Jones and sons, GM Greyme and sons and Royal Doulton. Any light you could shed on this for me would be appreciated. I am trying to check out the accuracy of the information I found in my fathers biography. He says that a Lt Mansell was responsible for throwing the Hardy’s ‘secret box’ over the side when she was beached instead of burning the information, which the Germans retrieved when the tide went out and were then able to decipher naval codes. Aside from all the great acts of bravery I wonder if this did happen and what the consequences were? My father, George J Quinn, was a Hardy Survivor. I think he was Petty Officer or Chief (not absolutely sure). He passed away in 1991, having taken a commission and retiring a Lieut. Commander in 1964. Our family lived in Plymouth (Beacon Park) and my dad served at HMS Drake before he retired. I’m extremely interested in corresponding with any relations of survivors or those killed in action. I notice there may be a few survivors. I would love to correspond with any relatives of those, who may have known my dad on ship. Also i would love to make contact with relations of Captain Warburton Lee, who have an interest in Hardy memories. I now live in West Midlands. I did drop you an email a couple of weeks ago but have not had a reply. I’ve got a new address (tony.quinn1949@yahoo.co.uk). I’d welcome correspond/meeting. My father Laurence (Larry)Peart served aboard the Hardy.He told us stories of how the germans kept firing on the survivors and how the Norwegian familys risked their lives to care for and help them return home. Dear Jane (McCarthy) I normally check the comments on a regular basis. However, with the festive season and my ongoing researches, to finally produce a book, it did not happen until now. Could you confirm from your father’s Service Records the dates your father Leading Seaman Ted Hamilton was on board HMS Hardy….because the ship related to this website concerns the Battle of Narvik 1940. Look forward to your reply and it may be I can provide information irrespective of what HMS Hardy Ted was actually on. Ron cope: you must be related to Cyril cope, right? I’m the Stiles in Canada that Cyril and Edie spent time with (Charlie and Kay Stiles – parents). I’ve worked with mike (second cousin) on the family Tree and I was unaware that you were involved with the Battle of Narvick. Great to know and i would like to stay in touch. I’d just like to thank you for devoting the time and the great effort into producing these pages on HMS Hardy. My Grandmothers’ brother Able Seaman Reginald Ankers both served and lost his life on the Hardy. His sister, (My grandmother) passed away at the beginning of February of this year and I know she would have been happy to know that her brother and those on the Hardy who lost their lives have been so fittingly remembered. Just found this website. It is very informative an the research and detail is much appreciated. Cpt Warburton-Lee was my Great Uncle, and I find it sad how few people have hear of him, his ship, his crew or know of the sacrifices made at Narvik. All the kids know who Wayne Rooney is, or Simon Cowell yet the heroes of the darkest period of the 2Oth Century lie forgotten. I have been reading this post with great interest. I am a Norwegian, living in the northern part of Norway. I have happened to inherit a finger ring of gold, from my great aunt Ingeborg Sandsvik, born 1895. She was a senior nurse in Bjorkasen hospital, where crew from HMS Hardy were taken after the battle. This ring has an inscription, 10.04.44 and a picture of HMS Hardy. As a small girl (in 1960) I was told she got this ring from the captain of HMS Hardy. As the captain died in the battle the ring must have been given by someone else, but certainly someone connected to the boat. Anyone who can help me to find out? Born 09/03/1900 Died 24/05/1994 (Leading Steward) was also an HMS Hardy survivor, from the battle of Narvic 1939.
i note that gunner geoffrey bailey is mentioned as a survivor, who lost his hand on hms hardy.He was my boss when I worked in social security in Blaenavon. He was the most lovely,gentle.interesting man you could have ever met,he encouraged me to take a step into the unknown,move away from home, and take a job in Income Tax in Cardiff, I then went to London where I met my husband to be,and we had a chance to meet 2 years later. He was a truly rare person. Aldo, I have some information on your Grandfather Anthony Briffa as well as the rest of the Maltese crewmen on ‘Hardy’. Thanks for your comments. I am in contact with a neighbour of Geoffrey Bailey’s wife. I intend to include Geoffrey in my forthcoming book on the ‘Battle of Narvik’. I have sufficient information for him to be included. However, it may be you have additional information of interest. If not then I would like to add your comments in recognition of Geoffrey’s part in the battle, especially his bravery to be able to survive his severe injuries and return back to Britain. I believe he eventually became the Mayor of Blaenavon, overcoming his disabilities. Hear from you soon. My dad was a survivor from hms hardy his name Stan shiner Wright, leading seaman awarded the BEM. If any ones family has knowledge of my late father please contact me. He was on the Rodney and later aircraft carrier victories. My name is John Foster and I am currently researching my father Bert’s navy record. This has thrown up an interesting aspect to the Hardy story which you may or may not be aware of. In 1940, Bert was a Stoker PO aboard the destroyer HMS Eclipse (H08). Early in April she was attached to the 20th Destroyer Flotilla for screening duties for the mine laying around Narvik. As you know the mines were laid around the 8th, and the next day Hardy and her sister ships were ordered to attack Narvik. Eclipse and the other destroyers held station with the minelayers. We all know what happened to the Hardy, but not so well known is the fate of the Eclipse. On the 11th April she was hit aft in an air attack off Narvik which resulted in 10 crew dying and major flooding. She was towed to Lerwick by 19th April and on to the Clyde for repair. Repairs took until July which meant she missed the Dunkirk operation, but she saw more service in the Med until finally sunk off Crete in 1943. That as they say, is another story. In our family the names of Hardy and Eclipse have always been linked together. My mother who was 100 this year and lives in Tavistock still vividly remembers Churchill’s speech to “Men of the Hardy and the Eclipse”. Yet the Pathe newsreel shot on the 22nd April 1940 refers only to the Hardy. My Dad is in the ship’s company listening to the speech (the tall PO in stills 37 et seq), and if you study the stills you will note all the cap ribbons read HMS Eclipse. No doubt there were some Hardy survivors present, but my theory is that the Admiralty did not want to disclose that most of the Hardy survivors were probably still on the Norwegian mainland at that time. Having almost a full compliment of Eclipse survivors to parade put up a good smoke screen. E.T. Stiles is my grandfather”s bother and I have a photo of him. Please have Rom Cope contact me. 28 May 2014. Message for Ronnie Walsh. You can contact me on roncope@btinternet.com. At the moment to my knowledge there is not an organisation which commemorates the ‘Battles of Narvik’. Due to the passing away of veterans members in the 2nd Destroyer Flotilla of Narvik, instigated in 1970’s by my father Cyril Cope, the association had to be disbanded. Here from you soon. Message for Ted Stiles I have now received your E Mail and replied. Great to hear from you and receiving the wonderful photograph of Chief Petty Officer Edward Stiles very much respected crew member on ‘Hardy’ by all those who knew him. Sadly killed when trying to assist others after the order of ‘Abandon Ship’ when more salvoes hit the ship. Receive your reply soon. At the start of 2014 at Ron Cope’s suggestion I decided to initiate a claim for my late father (Capt.Charles Boylan)war medals. It took some time to achieve due to the processes involved but,on the 21st August 2014 I duly received his medals. There was a total of four. Operation Rubble with MV John Bakke. At Ron Cope’s suggestion I applied for the Arctic Star Medal. The process took some months. I later received information that my father was entitled to four medals all told. The process took some months to accomplish but,I now have received those medals safe and well. My uncle was chief yeoman of signals on the Hardy.does anyone remember him ? I have been given a box of photos that I have been told belonged to a member of a german u boat crew. some of them some a ship sinking in a fjord…can I send them to anyone who might wish to identify them??? There is one photo that shows a lifering which clearly shows the name HMS HARDY. I have just seen one of the photos showing a grounded ship near a snow covered landscape is dated 13.4.40. i cant read the handwriting on the back. I am reading Ron Copes ‘Attack at Dawn’ and like him the name Narvik is implanted on my mind. My dads late brother Edward Orford (uncle Ted ) was a stoker on the Hotspur at the first battle of Narvik. I remember him telling me that he was the last man out of the wheelhouse before it received a direct hit ! He also said that they were towed out of the fiord backwards. Readers may find it interesting to note that I just managed to get an Arctic Star for his daughter. My late uncle Edward Orford (Uncle Ted to me ) served as a stoker on HMS Hotspur throughout WW2 .He was at the first battle of Narvik. I remember reading two interesting books one about Hotspur at Narvik and the other about Hotspur itself, I think it was called” The Turning of the Tide” Both lost in the depths of time. By the way I recently got a posthumous “Arctic Star”medal for his daughter. My late uncle Ted ( Edward Orford ) was on the Hotspur at the battle. Any information on reading material about the battle would be appreciated. Thanks Frank, from South Africa, now we are in touch, the photographs you sent are brilliant and unique. The one of the ship beached laid to one side could be HMS Hardy, before she was eventually, swept on the tides down the fjord. This especially as the photographer also took a picture of the ‘Hardy’ lifebuoy and stainless steel insignier of ‘Hardy’, apparently outside a fisherman’s chalet near a beach. Both are marked on the back of the copies 13/04/1940. The U-Boat crew member who took the photographs, after the Second Battle, was probably landed with others for respite. Either he was asked to take photos or just a photograhic enthusiast. Maybe we will never know, other than Kriegsmarine Petty Officer Theo Werner Schettler, taking the grathic photos never realised, 75 years later they would be included in my second book ‘Doomed Destroyer’ coming out shortly; and be there in perpuity. Contacts like you Frank, I have had to rely on, to make sure the Battles of Narvik and those brave young sailors, in the early stages of WW2, will never be forgotten. Ron Cope. I’ve been going through photographs belonging to my late Grandfather. He was in the RAF but amongst the photos there is a picture of a young man in navy uniform aboard the Hardy. The inscription on the reverse is ‘Bill – Killed at Narwick on HMS ‘Hardy’ April 10th 1940′. I wonder if it’s possible to discover his identity? I can’t find any other photographs or mentions of him amongst my Grandfather’s stuff. Thank you. Remembering My Father today remembrance Sunday who survived on HMS Hardy, Robert (Bob) Clarke. He was injured and strapped to the back of a door and taken to a German occupied Hospital and hidden from sight. I Can remember (think it was in the 80’s) going to a re-union in Portsmouth, many Germans were also attending. I may have met you Ron. I proudly have a picture of HMS Hardy hanging on my wall, it list all the names of the crew that were injured and killed during that day. My Name is James Howie. My fathers brother was called Thomas Howie. He was killed on the H.M.S. Hardy. He was born in Wallsend, North Tyneside. His friend on board, who survived was called Robert McKenzie. He lived in Liverpool. When I was a child, my family used to visit him and his family. Both families kept in touch for many years. The last time I met ‘Bob’ was around 1993. I was shown a picture, by my late uncle, of a sailor with beard, wellington boots and a heavy jersey. A story was told that he was a cousin of my father who was shipwrecked in Norway and walked a long way down Norway before getting back to UK. I live in Norway and belive that the story relates to the Battle Of Narvik. Have you information where I can obtain a crew list for His Hardy at the battle. My name is Derrick Atkins, I am the second son of Able Seaman Reginald Frank Atkins who I am reliably told was a survivor from HMS Hardy when she was sunk in the first battle of Narvik. He lived all his life near Newbury in Berkshire. He would on the very odd occasions mention a few bits of information about his naval life. He passed away in 2005 of bowel cancer. Since then I have heard of his involvement at Narvik and any bits of info would be appreciated. Thank you for reading this and any snippets that can be supplied. As a crewmembers on a later HMS Hardy ( F54) a Blackwood class frigate, we visited Narvik in 1960 and visited the graves of the crew mentioned in this book, we also met some of the Norwegians who had given aid and assistance to the crewmembers. This book really brings to life the momentous actions of all concerned both officers, crewmembers,civilians, British,Norwegian,German.